March 9th, 2019 Boston finally warmed up a little. Streets were crowded and businesses were starting to flood with people once again. Farrah Belizer, founder of LiteWork Events, along with Kenny Mascary from NYA.Boston, invited a couple of millennials together in an intimate setting at WeWork to have a chat with Michael Brun, a proud Haitian & Guyanese aspired doctor turned famous DJ and Record Producer. What was surprising to us was that he had a sold out Bayo Tour show at the Paradise Rock Club later that evening, but he still made the time to sit and talk with the attendees just a few hours before. Michael’s influences in his musical career came at very early age. His father was a musician and his mother played a variety of music at home—along the sorts of Kompa, Rara Band, Tabou Combo, 80’s music, Contemporary, Soul Rock, R&B, & even Wu-Tang. So it makes sense that although he originally aspired to go into medicine, he couldn't escape the call of music. What is it like bringing the Haitian culture to a national platform? I was born in Port-Au-Prince, Haiti. I wasn't planning on doing music when I was a kid. I was Pre-Med in college. I had a full ride to Davidson College and I wanted to become a Pediatrician. At a young age a big thing that stuck with me was how heavily involved my parents were in the community, education & social development in Haiti. I remember on the ride to school everyday I would see kids that wouldn't have access to school/healthcare and just basic needs. It really struck me, and from that point my parents made me understand the privilege I had just to have my basic needs met, and it was my responsibility to pass it on. I thought medicine was going to do that—in the most direct way—so I began to work in hospitals. At 14 I started producing. When I was 16 I went to military school for 2 years but was making music constantly—doing it for fun and posting it online and sending it to family and friends. It was horrible but I got good eventually. Then at 18, I got lucky where my music got picked up by a couple blogs, and over night I got a couple hundred plays and one song had 25000 plays in one night! Different music labels and management teams found out and an agency started hitting me up. But throughout this whole time I was a Freshman in college, I still had this mission that I was going to be a Doctor. My goal was to help my community and help my country. His family and school were very supportive and he felt that it was a natural choice to commit to his music. Michael made it clear that although things were moving fast in his career, his goal with music was (and still is) to make sure everything he did promoted the Haitian culture in the best light. Most recently Michael did a song with J Balvin called “Positivo”. I was careful with incorporating Haitian songs because I wanted to be respectful. Having access to that global audience has allowed Michael to take traditional Haitian sounds/culture and shed light on their meanings and importance. As the chat continued Michael shared some very insightful information on navigating the Arts & Entertainment industry to authentically build their brand. Part of what makes this successful—I had a 5 year career before any of this happened. I had 250 different shows. I released 40 songs and remixes. Worked with different DJs like Calvin Harris. I started at 19 and now I’m 27. I stop looking at things as success vs. failure but more as just experiences. I change my consciousness of failure vs. success I’m going to do , I’m going to create the best I can possibly can. It might do what I expect, might do worst, but I’m just going to go through it. I’m just going to remember this happened and I’m going to be more accurate over time. Everything I do visually, musically in term of the show, collabs, associations, my career, Bayo it comes from the same place. So it's consistent. The voice is consistent. I don’t feel like I’m making music or show. I feel like I’m creating a world. And everything that exists in the world follows the rules of that world. As the moderators opened up the floor to additional questions, event attendee Bernadine from “Know Your truth, Speak Your truth” & co-host of Urban Collective Podcast asked Michael “How has your music truly impacted Haiti and what have you been able to do with the proceeds”? Although Michael received two major label offers in the past, when he looked the term of it he noticed they were very restrictive. He realized those labels wouldn't have allowed him to do things (experimentally) to try to make different types of music or things. So he founded his only label Kid Coconut where his philosophy of label is about freedom and flexibility where he could create bigger impact and not have to follow specific rules. His label goal is to provide a platform for artists to release their music in a personal unfiltered way. I created the song Wherever I Go at Audio institute with the Artist Institute students in Jacmel, Haiti. We released it on the label and the gave 100% of the proceeds of the song to the scholarship fund of the school. In addition to that (because of the viral success of that song) Michael came up with the idea to do a music festival in Haiti. He was fully sponsored by Haiti’s national beer and rum companies Prestige & Barbancourt. I was able to have artist friends come down to Haiti and they all performed at the sold out festival. We ended up creating 33 scholarships for the incoming class at Audio Institute. After such great accomplishments, Michael continued creating events that would help create a bigger impact in his community and beyond. He curated Bayo block parties. From these events, he was able to donate products from Native Instruments to Audio Institute and the community. He capitalized on building relationship to ensure the Haitian community would receive his help in some way. How do we create different partnerships with brands that have the ability to make a change, but just don't know how to do it? I try to push them in the right direction. I want to “bigger scale” things that will have a much larger impact. The final question came from event attendee Stanley Rameau, Founder of Paul Rameau: “What fears did you face throughout your journey that almost stopped from transitioning and moving forward in the career you are in right now? This tour right now! The Bayo Tour 2019 that’s so successful at selling out. This tour was the most challenging thing in my life. Last year we had sponsors—this tour no sponsors. Even with sponsors we break even. It feels like everyone involved in the tour is volunteering in a sense. They are giving more of their work than what they're actually worth. The fear is while I’m building up… and at any moment it can topple over. Michael has built the Bayo Tour from the ground up from booking flights, securing hotels, and figuring out budgets. Even though it's a lot of work this is a sentimental tour. The point is not profit… the point is to promote the culture. It's a crazy stress doing the shows, but seeing it come together is amazing. We had the chance to attend the BAYO Tour show that night and the only word we could think of to describe it… AMAZING. 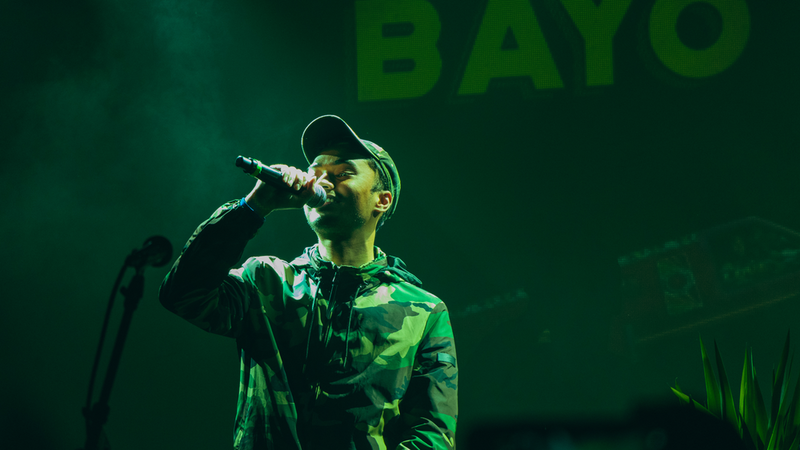 See some dope images from Boston’s sold out Bayo Tour show! With all of Michael’s Brun successes thus far its commendable & admirable how he consistently and wholeheartedly promotes and supports Haiti. He serves as a great role model to many due to his commitment to the culture and uplifting the community through his generosity.